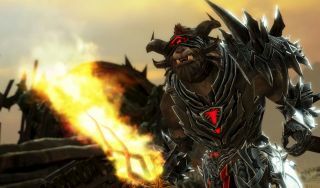 Guild Wars 2's first expansion, Heart of Thorns, was demoed at Rezzed this weekend, and Eurogamer were on hand to chop out a lovely chunk of in-game footage from the Twitch stream. We've seen the dense Maguuma Jungle before, but the above is our first proper looksie at the expansion's Desert Borderlands environment. Phil went hands on with Thorns (ouch) earlier this month, and had lots and lots to say about that.